From The Hartford Courant, with my emphasis. As Congress continues to chip away at federal funding for highways, transportation planners are stepping up talks about allowing high-tech tolling on many interstates – including I-84 and I-95 in Connecticut. Managers of highway toll systems in Florida, Washington and California met in Connecticut last week to talk about how tolls – under the right circumstances — can reduce rush-hour congestion and raise revenue for state or regional transportation systems. 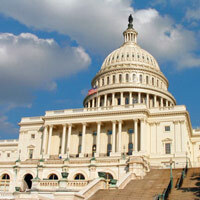 Is Congress chipping away at federal funding for highways? I would define “chipping away” as an actual reduction in the federal dollars granted to the states to maintain the Interstate Highway System. So I went to dot.gov, the federal government’s site, looking for budget information. The US Department of Transportation’s Budget Estimates for Fiscal Year 2013 has a chart on page 27 that has the yearly total budget increasing from $42.6 billion to $58.5 billion over the next six years. That’s a proposed 27 percent increase over six years. Certainly, this is a budget proposal and not yet fact, but are they planning to “chip away” at federal funding for highways? Looks like the answer is NO. 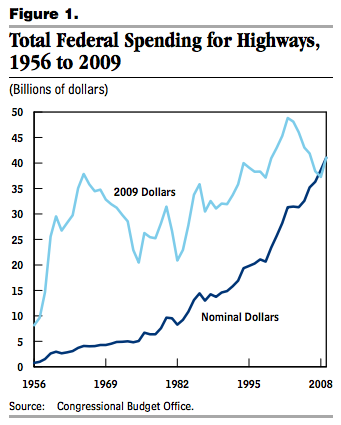 This report from the Congressional Budget Office shows total federal spending for highways between 1956 and 2009. In nominal dollars the funding goes up and up. 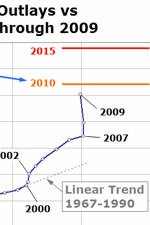 In 2009 dollars there is reductions shown, but there is a clear trend line UP. Keep in mind that when you spend the big dollars to build or rebuild a bridge or section of road, you certainly would think the bridge or road would just need maintenance and not a complete rebuild next year. And let’s not forget the American Recovery and Reinvestment Act of 2009, which including something like $50 billion on infrastructure and “shovel ready” projects. 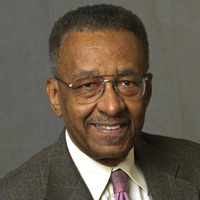 The point… if you’re going to claim – in the media or as a government administrator or politician – the federal government has been “chipping away” at funding for highways, maybe you should provide us the source information with real data and real funding numbers showing us the actual reductions. I’ll bet the unions are wildly in favor of tolls. Keep in mind the type of toll collection system they are talking about is the Easy Pass. The point being is there will be a lot of money for the politicians to siphon off into their personal accounts and their cronies. What is going on with the proposals to widen I84 and I95, especially from outside of Waterbury and along the shore? Didn’t Danny P. just refuse millions for these projects that have been proposed for years and years? They are sorely needed. As for the concept of tolls, my opinion is that those who use the roads should pay their own way. But, as I said, graft and corruption will follow tolls forever if they are instituted.